Teachers have the freedom to decide what to do in their tests during the year, as actually spelt out in the LPG and SAG. Teachers can follow an approved textbook, with its documentation, its order and activities, etc.. There is only 1 cluster meeting a year. What about moderation? Circulars/documents/letters may only go out once a year in September (for the following year). So we are free from forms for the coming year? One project, i.e. only the PAT as 'the' project. No more tasks? Role of subject/curriculum advisors still to be specified. If you communicate on the blog, keep in mind that EVERYBODY can see ALL messages. The answers for 5.2.1 and 5.2.2 on the memo have been swopped around. 6.4 The criteria for Previous_Experience in the memo should be the opposite of what is given in the memo. Please have a look and correct. Q2.3 i) the spell check should ignore all 'computer' terms – also "MXit"
V1.5 e) Let mooi op die inlynstelling en oriëntasie van die teks in elke deel van die kaartjie. My learners keep asking what will be on my exam paper and how do they know if they know the work. They should look at the end of chapters and be able to do every thing on the check lists. Teachers should look at the LPG and cover everything listed per grade. The internet is wonderful! Last week I could not walk my dogs properly as one is just too old to keep up. Having one dog pulling and one who cannot walk and needs to be carried, is not fun. 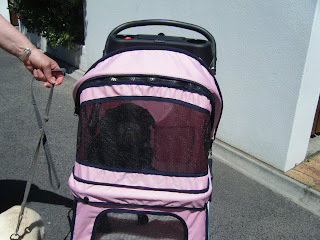 I recalled what the vet physio had told me to do some months ago to do – buy a pet stroller. I went online to search for one and found some on Gumtree. 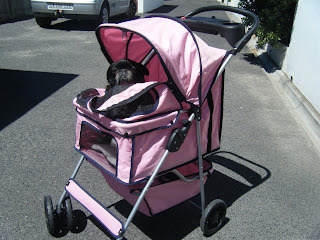 I did a further search and found an online shopping site http://www.apetslife.co.za/ for pet supplies. I found what I wanted on the site. Recalling the PAT and trustworthiness I looked for details - the site did not look ‘smart’ so … I phoned them and a voice replied – yes it was an active site. I had to pay – I looked for signs of security – I paid by EFT although the Thawte key was there. It was delivered to Cape Town and I received a call to fetch (save on delivery costs). Well it costs about the same as a wheelchair, but we can walk. And we have walked! She is picked up and put in the stroller at home, and walked to a quality place to play, where she is lifted from the stroller, for play time. Look at the pictures a friend and I took. She was happy from the first day. The lesson – get it online!